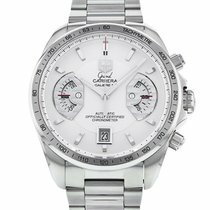 One of the finest modern designs by TAG Heuer, the Grand Carrera chronograph, model reference CAV511B. 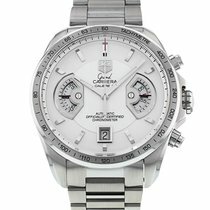 A stainless steel automatic chronograph with ivory dial and stainless steel bracelet. An unused TAG Heuer black alligator strap with stainless steel folding clasp is included (these are over £400 new). 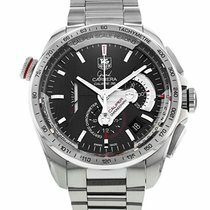 The watch is pristine, and complete with TAGT Heuer boxes, instructions, warranty card and COSC chronometer card. We can arrange fully insured worldwide delivery, the buyer is responsible for all local import duty and taxes.